IMMEDIATELY FOLLOWING THE AMERICAN Academy of Dermatology meeting every year, skincare becomes top of mind for all practitioners. 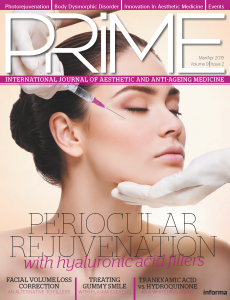 With so many new entries into the category of physician-dispensed skin products, it appears that this segment of the aesthetics industry is booming. On the investment side, they also noted, ‘Consolidation dynamics have reached a plateau in the dermatology sector with a shift towards skincare,’ citing that 2018 showed an increase in the number of transactions in the skincare segment equal to 61% of the total deal value and 59% of the deal volume. Driven by an ageing population and the rise of younger patients diving into age-prevention in their 20s, the cosmeceutical market is ripe with brands that offer differentiated and multiple benefits. Pollution exposure has also created new threats for ageing skin, which has contributed to an increase in demand for novel formulations and delivery systems that provide convenience, single serve and travel-sized options, and meet the multi-tasking needs of over-scheduled skincare users. Consumers who buy their skincare from professionals tend to be a well-informed group who know about ingredients and pay close attention to trends. While anti-ageing remains the largest segment, acne therapies are in demand along with skin brightening and pigment control. Customisation also ranks high among these skincare buyers. Technology continues to play a bigger role in skincare delivery. The new crop of advances allows consumers to customise their skincare regimen and get answers about their specific needs without going to a clinic or retail store. Mobile apps that offer consumers simple ways to evaluate their skin and select products are picking up steam. For example, OKU™, Your Personal Skin Coach, just launched an iPhone connected device to scan your skin and get real-time, personalised skincare advice. Another model, Skintelli™, utilizes the science of epigenetics to identify the current quality of an individual’s skin by taking a quick skin sample and shipping it by mail to be able to match consumers with customized product recommendations from several thousand brands based on DNA profiling. Another trend to watch is how doctor-driven brands are gaining traction among consumers who are seeking out practices that feature these exclusive brands. Social media channels have had a massive impact on how consumers learn about new science-based products and check them out before they try and buy. They are checking reviews and comparing notes in Facebook groups, on Instagram, YouTube and Pinterest, and searching for real user-generated comments. Even with professional products, brands that are creative and active on these critical platforms can stay visible to their target audiences. Here are some notable recent physician-dispensed skincare launches to check out. 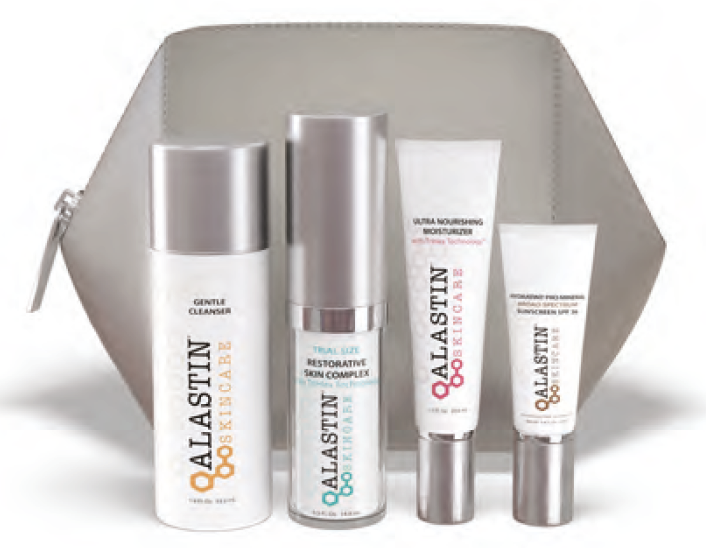 ALASTIN® TriHex Preview Regimen With TriHex Technology® This handy trial kit offers a full regimen of four of ALASTIN’s hero products in TSA-friendly sizes designed to allow for up to four weeks of usage. The kit includes the sulfate-free Gentle Cleanser, Restorative Skin Complex with TriHex Technology, Ultra Nourishing Moisturizer with TriHex Technology, and HydraTint Pro Mineral Broad Spectrum Sunscreen SPF36. It is positioned for both first time users and devotees of the brand’s TriHex Technology-based product range. TriHex Technology helps support the skin’s ability to rebuild and recycle the extracellular matrix (ECM) by clearing out the damaged by-products of ageing, promoting the skin’s ability to generate new skin. 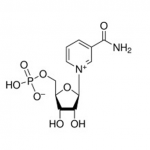 Emepelle is the first and only skincare range targeting the appearance of Estrogen Deficient Skin (EDS) by harnessing the restorative benefits of patented MEP Technology™, which is clinically proven to safely and effectively help address the root cause of Estrogen Deficient Skin non-hormonally. 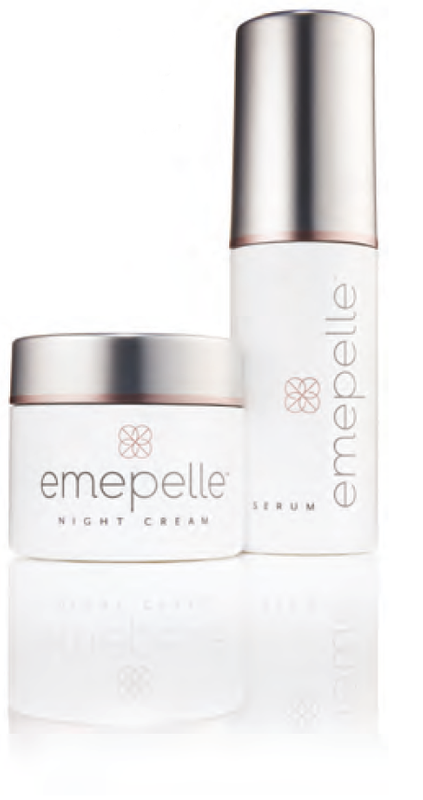 Emepelle addresses the effects of EDS, including increased dryness, wrinkles, and loss of firmness. This cream combines Decaplex-10™, an exclusive blend of peptides and antioxidants, with hyaluronic acid and plant-derived ingredients to help support the skin’s own healthy collagen production. Used twice daily, the treatment acts to enhance skin texture and tone, diminish wrinkles, for a rejuvenated look of the face and neck. ‘I’m impressed with the innovation of PEP UP’s formulation — a unique blend of ten peptides combined with cutting-edge antioxidants and ingredients for hydration. 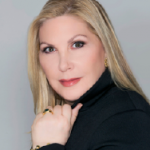 In both the clinical study, which we participated in, and at our practice, we’ve seen significant improvements in skin texture and tone in patients who are using this product singularly as well as those who are using it in conjunction with other advanced skincare products,’ said Chicago, IL Dermatologist Amy Forman Taub, MD. 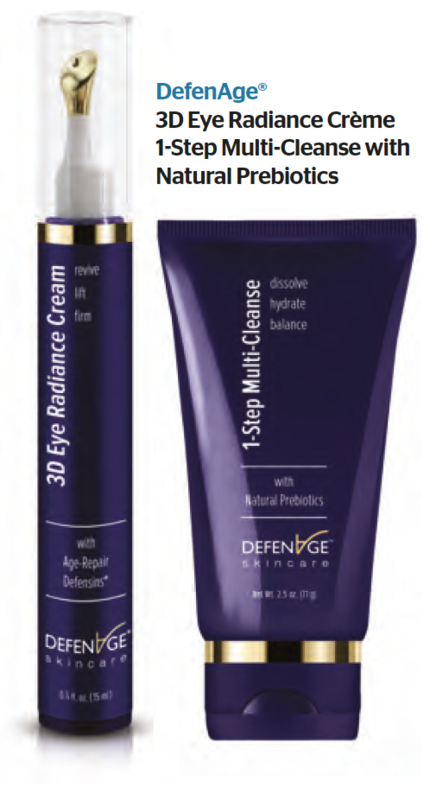 This newest addition from DefenAge was developed expressly for targeting delicate skin around the eyelids with Age-Repair Defensins®. The gold metal applicator uses Cooling Tip Technology for a finger-free application that provides a cooling sensation to reduce puffiness. For best results, users are advised to apply while skin is still moist by pumping a drop of the cream onto the applicator and lightly dabbing three dots of cream above and below each eye. With continued use, it helps to fade discolouration and reduce the appearance of fine lines under the eyes, and lifts and smooth the upper eyelid area. Containing Age-Repair Defensins® patent-pending technology, this cleanser can remove waterproof eye makeup, dirt, oil, debris and the effects of pollution while leaving the skin feeling hydrated. Natural prebiotics help to maintain the skin’s protective barrier clean, soft, healthy skin. 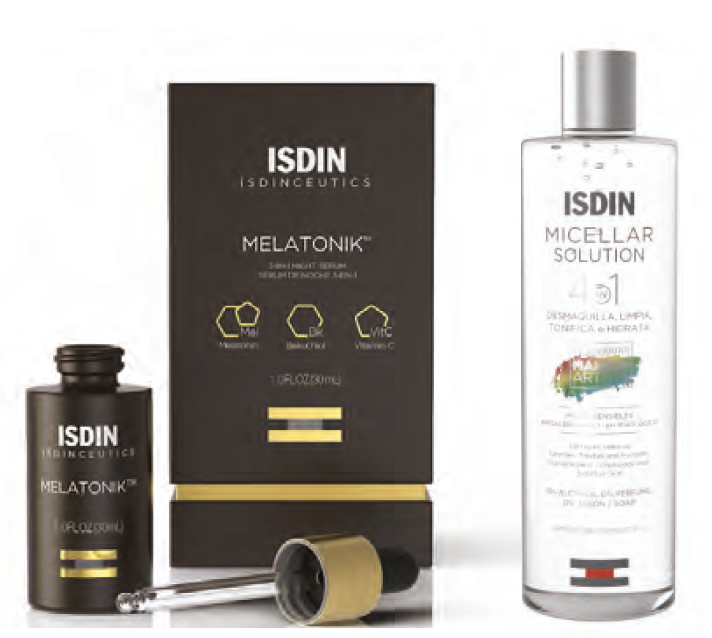 ISDIN Micellar Solution is a no rinse formula that gently removes makeup from the face, eyes, and lips, including waterproof types, without altering the skin’s natural barrier, and is suitable for all skin types, including sensitive skin. This 3-in-1 night serum was developed to work while you sleep by stimulating the skin’s natural antioxidant defences, repairing environmental stress and damages from the previous day and supporting healthy, younger looking skin. It contains Melatonin to protect against free radicals caused by UV radiation, oxidative stress and pollution, Bakuchiol that has natural retinol-like properties, and Vitamin C.
This hydrating night cream combines Sente’s patented sulfate technology, DSA (Dermatan Sulfate Analog) and CSA (Chondroitin Sulfate Analog), with a 0.5% encapsulated pure retinol to improve skin tone and texture while diminishing coarse wrinkles. Sulfated Glycosaminoglycans improve overall skin health and are natural water binders that aid in controlling inflammation. This super dense triple-action formula rehydrates a compromised skin barrier to bring moisture back to the skin. An ultra-rich moisturising treatment, it can be used for the face, neck, and décolleté. ‘I’m obsessed with TRIO Rebalancing Moisture Treatment. The first time I tried it, I thought, this is the way skin is supposed to feel. The patented formulation has been proven to increase skin hydration by improving skin barrier function, as well as increasing the production of hyaluronic acid and natural moisturising factor (NMF). Skin looks smoother, brighter, and more supple,’ said San Antonio, TX dermatologist Vivian Bucay. Glycolic 10 Renew Overnight is formulated with a free acid value of 10% glycolic acid to promote exfoliation and natural cell turnover. This potent night cream contains 2% phytic acid to promote skin clarity and brightness, with a triple action-soothing complex to help support the skin barrier. It can be used as a complement to in-office peels to pre-condition skin. This single sterile mask features medical grade active ingredients including fractionated hyaluronic acid, green tea polyphenols, caffeine, resveratrol, and peptides to offer instant relief after aesthetic treatments like lasers, microneedling, peels and injectables. The blend of calming botanicals, including Chamomile, Cucumber, Yucca Root Extract delivers an immediate soothing sensation to the skin while reducing the appearance of redness. Formulated with skin-brightening arbutin, this hydroquinone-free formula harnesses the power of pigment-correcting botanicals to improve discolouration, brighten skin, and even out skin tone. To prevent inflammation, this cream includes peptides and glycerin to support the skin barrier while enhancing overall radiance. This rich creme relieves symptoms and calms severely dry or compromised skin and soothes irritation. Key ingredients include soothing shea butter, oatmeal, Ophiopogon Japonicus Root Extract, Vitamins C, E, Retinyl Palmitate and Beta-Glucan. It replenishes the skin’s natural moisture and restores skin barrier function to speed recovery and reduce itching and redness. Ideal for all skin types, this deeply moisturising formula is especially useful for thinning and sensitive skin to minimise flare-ups. With frequent use, the skin feels healthier, smoother, and more hydrated.